So, basically…I’m obsessed with this book and think everyone should read it. Moxie is narrated by Vivian Carter, a “good girl” who attends high school in a small town in Texas that worships the football team and seems designed to keep its female population oppressed and subjected to sexist behaviors and comments on a daily basis. Inspired by her mother’s younger days as member of the punk rock feminist movement called Riot Grrrl in the early 90s, Vivian decides to fight back by publishing an anonymous underground feminist zine, which slowly turns into a quiet–and then much louder–movement at her school. Meanwhile, Vivian also ventures into unfamiliar romance territory with a new boy at her school, struggles to understand her mom’s new relationship with a man from her work, and worries over her best friend Claudia’s difficulty understanding the Moxie movement and Vivian’s new friendship with a new student named Lucy. Moxie should be required reading for every teenager, both male and female. This beautiful book somehow manages to do it all, in terms of young adult fiction. It features an incredibly dynamic main character and includes a fantastic teenage romance, complex friendships, parents worthy of several eye rolls, and plenty of high school drama; however, Moxie also includes crucial lessons about gender inequality and racial divide. From the very first page, I felt my inner feminist doing cartwheels in my heart, and she jumped, cheered, shook her fists in anger, and wept with pride all the way through the final page. Reading Vivian Carter’s thoughts was like reading about myself, if I had attended a high school in Texas and been introduced to the idea of feminism earlier in life. She did everything she was expected to do and never caused trouble. She made good grades, tried to stay out of the limelight, and never let her mother or grandparents down. That was me, in high school. If Vivian was a real person and been a student at my school the year I graduated, she would have been part of my tightly-knit circle of friends, and I found myself identifying with her so closely that I became more invested in her story than I ever anticipated. Vivian is a highly relatable character, and Jennifer Mathieu made an excellent decision by making her a straight-laced student instead of a born rebel. Had Vivian been the kind of girl who spoke out about issues often or made waves when something bothered her, her decision to begin creating and distributing her zine, Moxie, would not have had the impact on readers that it did. Instead, her decision showed the power in stepping outside our comfort zones to stand up for the things we believe, and the change that Vivian underwent throughout the book was like a rallying cry for all the girls in the world who are tired of being subjected to sexism. 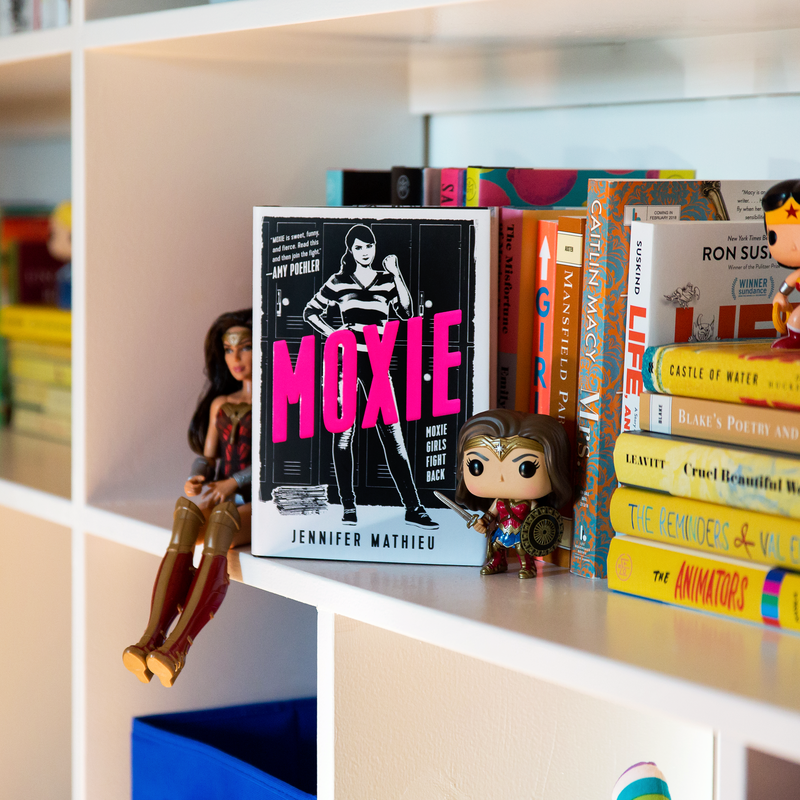 Moxie serves as an incredible introductory guide to feminism for all teenagers. First and foremost, the behavior of the boys at Vivian’s school and the lack of response from the administration and teachers highlights the need for feminism in the first place, and the response of some members of the female population of the school also demonstrates the reasons that many girls are hesitant to adopt the cause. Furthermore, Vivian’s frustrations with Seth, even though he is not like the other boys at her school, show the difficulty the male population has in understanding the feminist movement, even when they are open to understanding as much as possible, because of the indoctrination of their gender. Finally, Mathieu also does an excellent job highlighting the concept of intersectionality and showing that within females, we divide ourselves because of issues of race, sexuality, and class, and that feminism is truly a movement that encompasses us all, not just middle-class white women. Some readers may take Moxie to task for the discriminatory nature it seems to take toward football players and Republicans, at times. The behavior of the football players at Vivian’s school is extreme, and readers may be left with the idea that Mathieu has a major chip on her shoulder in regard to high school football players because of the intensity with which Vivian and her friends describe their feelings toward them. While I do see this point, I also think that the book makes an important statement about the power of a group mentality like that of the football team at Vivian’s school and the overwhelming importance that many schools in our country place on male athletes in comparison to females. In addition, Vivian’s comments about her mother’s Republican boyfriend might turn some Republican readers away, but those who read the book closely will notice the valuable points made by Vivan’s mother about different political views later in the book. Jennifer Mathieu has crafted a magnificent novel that saw my cheeks covered with tears toward the end and sends a priceless message about girl power. Readers of this spunky book will want to grab the nearest bullhorn and tell EVERYONE that Moxie Girls fight back. Posted in Young Adult FictionTagged book review, Feminist Books, Feminist Fiction, Feminist YA Fiction, Feminist Young Adult Fiction, Fiction, Jennifer Mathieu, Moxie, Moxie Girls Fight Back, YA Feminist Books, YA Fiction, Young Adult Fiction, Young Adult Fiction ReviewBookmark the permalink.